CHICAGO – Everyone’s favorite monster returns tonight with the sixth season premiere of “Dexter,” Showtime’s greatest hit and a program that has often ranked as one of the best on television. The show is at a crucial turning point in that the creators have admitted that this is kind of a reboot for the series, picking up a year after the activity of last season. When we look back on “Dexter” will this be seen as a new chapter — “Dexter 2.0” — or the afterthought/epilogue to the seasons that really worked? There’s reason for hope, but a shaky first episode could concern even loyal fans. The question that will clearly be a focus yet again of this season of “Dexter” is how to determine who exactly does deserve it. Dexter’s world view and set of rules basically allows for little wiggle room. And it certainly doesn’t allow for finding God and getting your life in order. What if a young man does wrong but atones and finds religion? Does he still “deserve” to die? 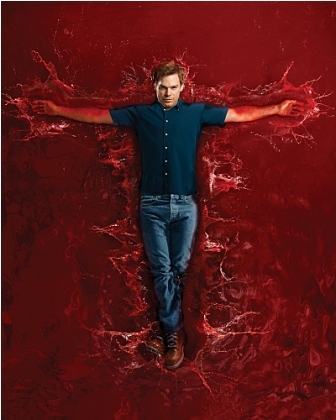 The idea of how faith plays into Dexter’s life is the focus of at least the first arc of the new season of “Dexter” (and given the press kit that features an image of Hall in a crucifixion pose, I’m guessing it will be a season-long theme). How does God play a role in the life of a real force of righteous vengeance? Dexter starts asking himself these questions while trying to get Harrison into a good school. It raises questions about how to present him with religion or whether to do so at all. Meanwhile, a pair of maniacs are beginning a bizarre murder spree that is clearly meant to both fit snugly in the religious theme of this week and remind us of the dynamic between Dexter and his father Harry (James Remar), in which he was taught his rules of murder. 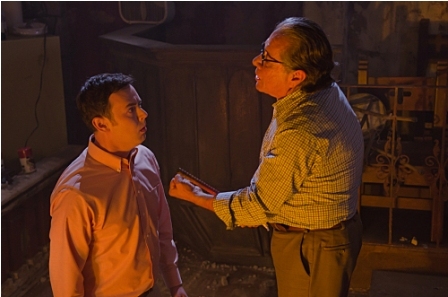 The teacher-student dynamic this year is between Professor James Gellar (Edward James Olmos) and Travis Marshall (Colin Hanks), a pair getting started on what feels like a biblical cleansing of Miami. The murderous duo that will dominate most of the season is still in the background at the beginning of this chapter of “Dexter.” To start, Morgan is involved in an old-fashioned vengeance killing, but this one has a personal spin. One of the few girls who was nice to him in high school was found battered by her abusive husband a few years later and Dexter is ready to use the reunion to get justice (and, hysterically, become the object of affection for a lot of classmates who didn’t notice him in school). Meanwhile, Quinn (Desmond Harrington) wants to take his relationship with Debra (Jennifer Carpenter) to the next level but is derailed by not only her typical hesitation when it comes to anything serious but a major career change for Dexter’s sister. The station has a typical amount of drama with LaGuerta (Lauren Velez) with her recent promotion, Angel (David Zayas) still getting over the busted relationship, and Masuka (C.S. Lee) managing a new group of interns in his own unique way. Mos (formerly Mos Def but dropping the second half in the credits) and Aimee Garcia also guest-star as recurring characters. I’m a huge fan of “Dexter” but I’ll admit to being a bit thrown off by the season premiere. It feels a bit repetitive and if viewers feel like this show is starting to tread the same ground, they’re going to be understandably wary. 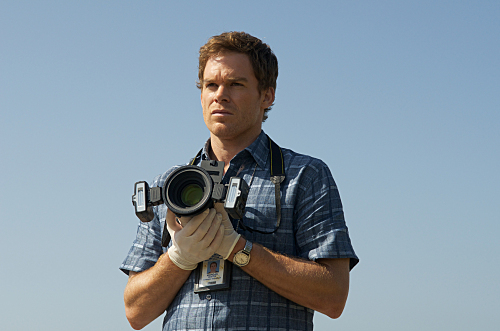 The reunion stuff with Dexter is fun but overly familiar. And I’m not yet convinced that Olmos & Hanks will make the kind of fascinating guest stars that the show has produced in the past. On the other hand, Mos, as a man who appears to have turned his life around and challenges Dexter’s rules and religion, could be the highlight of the season. But he doesn’t appear until next week. Overall, the second episode of the new season is much stronger and it’s not like the premiere is a disaster. It’s kind of just a warm-up. It’s a reintroduction to the characters after a lot of time off in their fictional world. We need to catch up with them. We need to set the foundation for where the season will go from here. Don’t jump ship if you’re disappointed. This is still one of the most creative, well-written, well-performed shows on TV. Let ‘em have a weak premiere. They turn it around in episode two and I can’t wait to see where they go in three and beyond. The jury may still be out on the success of “Dexter 2.0” but there’s every reason to think that this constantly-inventive show can pull it off. “Dexter” stars Michael C. Hall, Jennifer Carpenter, Desmond Harrington, C.S. Lee, Lauren Velez, David Zayas, James Remar, Colin Hanks, Mos, Edward James Olmos, and Aimee Garcia. It returns for its sixth season on Showtime on October 2nd, 2011 at 8pm CST. Submitted by Anonymous (not verified) on October 2, 2011 - 7:01pm. That wasn’t his college reunion. It was his high school reunion. Submitted by BrianTT on October 2, 2011 - 7:31pm. Submitted by Anonymous (not verified) on October 3, 2011 - 7:49am. Dexter is my one of favorite shows. Julia and Michael are my favorite actors.